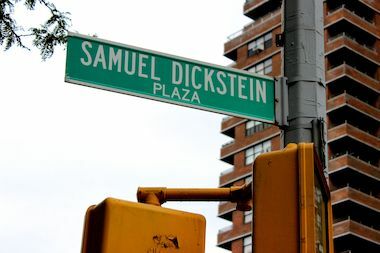 Henry Street Settlement wants to rename Samuel Dickstein Plaza after the settlment's founder, Lillian Wald. LOWER EAST SIDE — A block that for 51 years has carried the name of an ex-congressman turned Soviet spy has become the target of a nonprofit's renewed campaign to rename it for a pioneering philanthropist. Susan LaRosa, the marketing director for the Henry Street Settlement, is gathering petition signatures to change Samuel Dickstein Plaza, named for a 1930s legislator and spy, to Lillian Wald Way, to honor Henry Street Settlement's founder. LaRosa began working to rename the block of Pitt Street, between East Broadway and Henry Street, last year, after learning about Dickstein's past. She recently renewed her efforts and is trying to build support for the change in the community. 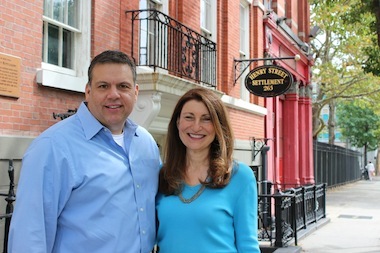 Henry Street Settlement Executive Director David Garza, left, and Susan LaRosa, marketing and communications director, stand in front of their offices at 256 Henry St. They are working to rename Samuel Dickstein Plaza after the organization's founder, Lillian Wald. “[Dickstein] doesn’t deserve his name on the plaza,” LaRosa said. As a congressman in the 1930s, Dickstein built a reputation for aggressively pursuing radicals as the vice chairman of a House subcommittee on un-American activities and the chairman of the immigration committee, according to The New York Times, which first reported on the history of the street's name last year. Dickstein also served as a New York Supreme Court justice and the city named the street after him in 1963, nine years after he died, the paper reported. But decades later, documents in Soviet archives revealed that Dickstein had been paid $1,250 each month from 1937 to 1940 by the Russian security service, according to the Times. LaRosa learned about Dickstein’s turncoat history shortly after she began working at Henry Street Settlement about six years ago, she said. She was curious about the man behind the name and began researching. With the support of Henry Street Settlement Executive Director David Garza, LaRosa began efforts to rename the street after Lillian Wald, who founded the settlement to provide health care and social services for poor immigrants in 1893. However, LaRosa and Garza were both too busy last year to get the effort off the ground, so it took a back seat until recently. In May, Henry Street Settlement began collecting signatures in support of renaming the block, which is near the nonprofit's administrative offices. So far, 300 people have signed the petition, LaRosa said. LaRosa also contacted elected officials and Community Board 3 for guidance on the process. She will appear before CB3's transportation committee to ask for their support at a meeting Sept. 4. The Department of Transportation said it could not change the street sign until the City Council voted to name the block after a different person or organization. Councilwoman Margaret Chin supports the idea of renaming the street but wants to hear community input before taking a position on what it should be called, a spokesman said. LaRosa said she understood why the street had been named after Dickstein more than 50 years ago, but she thought the new information should be taken into account.